I wish I could take credit for the look of these cards but all of the artistic heavy lifting is completely borrowed. First, the artwork is not mine. Most of the images come from creativecommons.com searches, deviantart.com or, well…, “borrowed” from various fantasy art sites. The overall structure and creation of the cards are from the website Mtgcardsmith.com. 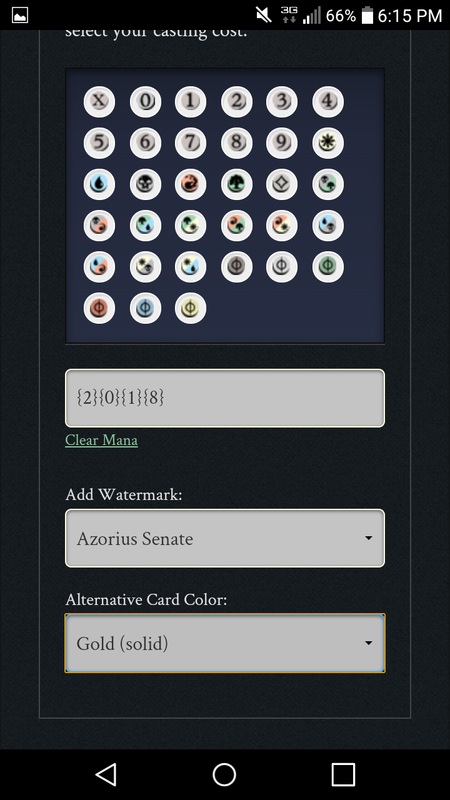 This website is a custom card creator for the Magic the Gathering Trading Card Game. The fantastic part of the Mtgcardsmith is that it is incredibly intuitive and user friendly. Click on the link above and you can have a fully customized card within minutes. If you have an appropriately sized image already on file and know what you want to write in the message box you can have a professional looking card image file in under a minute – literally! I made this one on my cell with spotty 3G during my son’s basketball practice in about 3 minutes! After some time with the website the deep customization elements become more apparent. The major details, creating the card’s name, image, message, and alternative card color are all pretty straight forward. In fact the program will not let you advance if some parts are not filled in. A helpful red box will highlight the missing information. Simple drop down menus add to the deeper customization. There are a huge variety of outside colors to choose from. The creator can also select from a huge variety of watermarks and icons, and then set a rarity status. 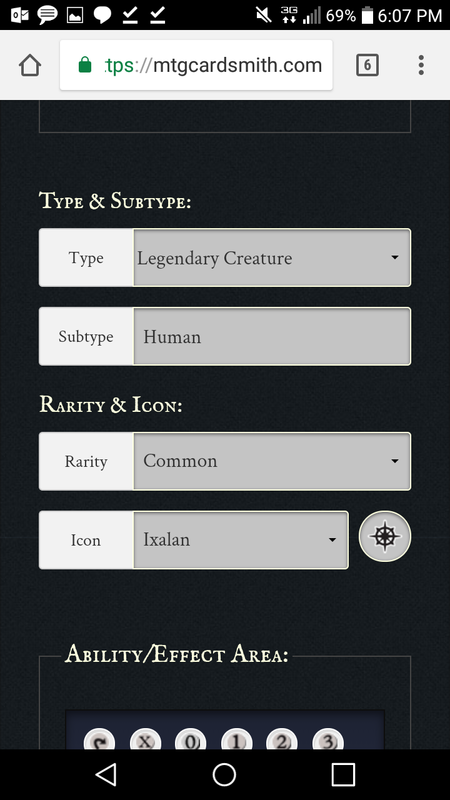 Also available are “mana” cost icons that can be added to the name bar or in the text box. I started the card around 6:05 and finished at 6:08. (Again, spotty 3G and the 6:15 screenshot was when I realized I missed that section). There are a few options after the card is created. You can simply right click on the image and save it to your computer. 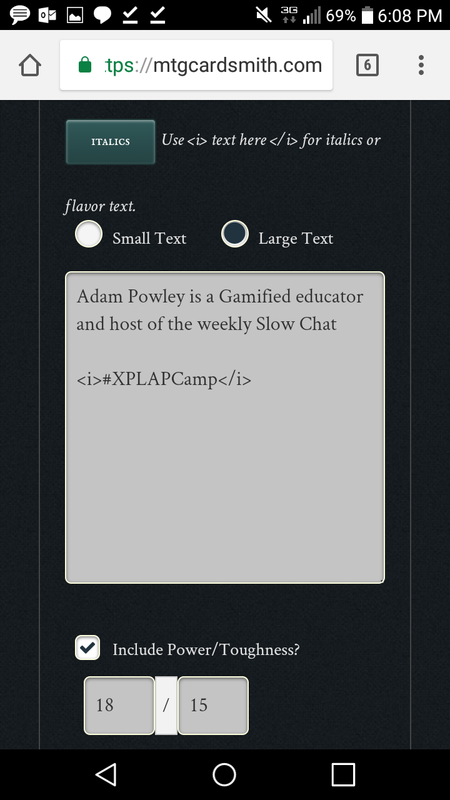 This is typically the route that I take, however Mtgcardsmith also gives the option to create a username and password and save the cards on the website. As I become more adept at using the site and more reliant on using cards for items, powers, and even assignment delivery I am considering saving more to the website’s database. This way when I want to tweak a card I don’t need to go through the whole process again with all the raw materials but can just open the card and tweak the parts I need to adjust. Think of how you might want to categorize your cards. What types should be have a gold border versus red? What is an artifact v. a creature? What icons will be used and why? Will you want a watermark? Use Google Draw to change the size of the image you want to use. 316×232 pixels. Open a Google Draw file and customize the size of the picture in this ratio. Then just add the image and resize. Mtgcardsmith also wants landscape pics. Use Google Draw custom settings for portrait oriented pics to add space on the edges. When printing the cards I use a color printer on card stock or onto reguar paper and then laminate. Putting contact paper on printed card stock apparently creates a playing card feel and protects the card. When going to print on my PC. I right click and hit print which brings up the photo print option. I select the wallet size which puts 9 pictures on the page. This is a little smaller then a regular card; however this can bebsved as a odd and it is fast and easy to cut. 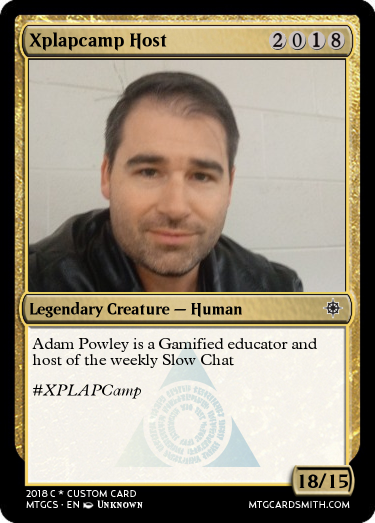 Oh, and you get a professional looking card with a simple to use interface for FREE!